Adopting a pet is no simple matter. A potential pet owner has to come to a shelter, meet all the pets to see which ones are a likely fit, and then they have to begin the paperwork. However, the shelter can make that last step a great deal easier by simply utilizing a pet adoption template, which can make everything go that much more quickly and smoothly from start to finish. What is a Pet Adoption Template? A pet adoption template is a simple form that has most of the necessities already filled out. 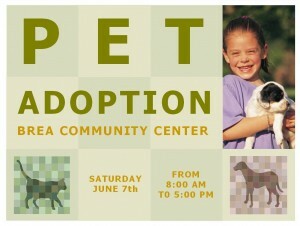 It runs in Microsoft Office, and all a worker has to do is fill in the blanks to create a unique, compelling poster that popularizes a pet adoption event. Creators can use all kinds of trappings, from photos to unique text to draw the eye, but in the end it’s pretty much a simple, fill-in-the-blank sort of tool. Once all of the blanks have been filled in, all that’s left is for the shelter or pet adoption facility to print out copies and start distributing them. How Does This Pet Adoption Template Work? Getting and using the template is actually a fairly simple process. All one has to do is go to the link and click the download button. Once the file has been downloaded onto the computer, all that’s left to do is open it up to make sure it works. If there’s no issue with the download then the user clicks Save As, and then saves the particular file they have open under an easily identifiable name (promotion name, animal type, etc.). Once the file name has been created the individual simply fills in all the blanks, saving the file regularly in case there is a hiccup h along the way in the process. Once the template is fully filled out, all that’s left to do is to print out copies and file away the appropriate paperwork. This template comes with a large number of benefits. First and foremost, it costs nothing to download or to use. This means it can be downloaded again and again, and put on as many different machines as one wishes to. It’s also simple and straightforward, so there’s no particular computer savvy required. It’s easy as point, click and type; a boon to centers looking to save money, and a simple paperwork solution.